Internationally trusted, respected, and recognized symbol for premier training. 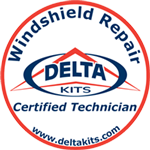 Delta Kits certifies windshield repair technicians in all areas of automotive glass repair. Knowledge based training as well as hands-on training. Over 70 years automotive glass experience. 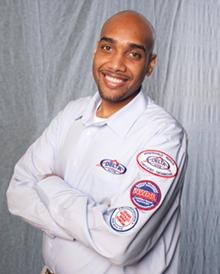 Finding a competent windshield repair technician should never be left to chance. The Delta Kits Certified Technician symbol is internationally trusted, respected, and recognized for the premier training that it represents. Delta Kits, an industry leader for more than 30 years, certifies windshield repair technicians in all areas of automotive glass repair. Only technicians who have successfully completed the Delta Kits training and certification course are authorized to display the Delta Kits Certified Technician symbol. Unlike other industry certifications, the Delta Kits windshield repair certification program consists of knowledge based training as well as hands-on training with technicians who have a combined over 70 years automotive glass experience. 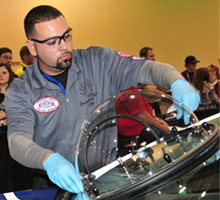 Following course completion, certificates are only awarded to technicians who demonstrate proficiency in repairing windshields and pass a ROLAGS™ —Repair of Laminated Automotive Glass Standards, the industry’s best practices — based written exam with a score of 83% or higher. Don’t trust your car to just anyone, insist on a Delta Kits Windshield Repair Certified Technician! *The Repair of Laminated Automotive Glass Standard (ROLAGS™) represents the windshield repair industry’s statement of best practices as compiled under ANSI guidelines by a “balanced” committee of windshield repair system manufacturers, glass manufacturers, windshield repair and replacement retail practitioners, trade associations and other “interested parties”. Delta Kits is a member in good standing with the National Windshield Repair Association. "Bruce is a FANTASTIC trainer and a huge assest to the company. He presents Delta Kits VERY well and how an excellent demeanor and attitude. I LOVED IT! I brought my whole team down for a special class that Delta Kits did just for us. The crew is feeling more confident and skilled, ready to go make more money. My investment with Delta Kits has already had returns in my guys confidence and passion for what we do." "My training experience with Delta Kits in Eugene, OR was one of the best training classes I have ever attended. From the first time I walked into the door until I left, I was over shadowed with a professional staff. The onsite training was incredible. 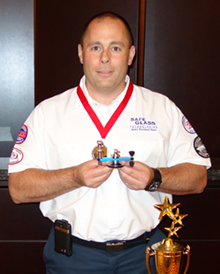 Bruce McDonald a Delta Kits training instructor is a highly motivated individual dedicated to each student. To be able to have immediate access to an instructor to answer questions and to guide you every step of the way in the Windshield repair business is invaluable. No training DVD or video can ever match this type of classroom experience. I left with assurance I can deliver the best for my customers and feel confident they will only receive the highest quality of work from me. I would recommend this training to anyone considering a business in auto windshield glass repair."